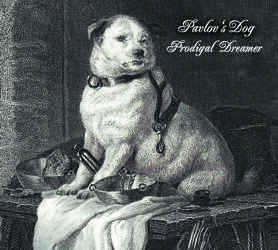 8 years after the last Pavlov's Dog studio album the „prodigal dreamer“ David Surkamp once again shares his poetic songs and musical tales with us. For a band that releases about one album per decade a new album is truly an extraordinary event. „Prodigal Dreamer“ for David makes a special dream come true. The album contains a collection of songs that came together over the years, each one specifically picked and relating to a personal story. New compositions of the past eight years combine with just lately accomplished pearls of the past decades to a harmonious whole. Finally, the artwork closes the circle to Pampered Menial, the album that started it some 40 years ago. „Prodigal Dreamer“ was recorded by method of room-miking. In this process the band performs together in one room, without clicktrack or similar appliances. The performance hereby is captured „for real“. This recording method is an art for itself that today only few sound engineers are in control of. Paul Hennerich is an expert in this field, handling e.g. broadcasts and recordings of the St. Louis Symphony Orchestra or monitoring renowned jazz projects. This procedure mostly passes on any post-processings. In this way an unequalled authenticity, warmth, dynamic and „in real character“ is achiefed, that interprete the sensitive songs on „Prodigal Dreamer“ also soundwise in an appropriate way … and give the listener the feeling of being right in the middle.